The Day After Tomorrow. Knowing. 2012. What do all of these movies have in common (other than being complete wastes of time and money)? They are all crappy thrillers where the protagonist learns of the coming apocalypse and, using that knowledge, tries to save the earth. All of them were also number one on opening weekend and considered financial successes. So you know what that means: we get another one. Producer of favorites like Doom, Imagine That, Transformers: Revenge of the Fallen, and G.I. Joe: Rise of Cobra, Lorenzo di Bonaventura and Lionsgate are now producing Panopticon, the newest from director Peter Cornwell and writer Craig Rosenberg, according to Variety. The film follows a salesman (enter "everyman" actor here) who receives a "pre-recorded message to himself" telling him that he has to save the world from certain doom. Research finds that a panopticon is a prison designed by Jeremy Bentham that allows an observer to watch over the inmates without the inmates being able to tell who is watching them. What this has to do with the movie, I have no idea. This is the part in the article, however, where I complain about Hollywood being completely devoid of original ideas, but I feel as though at least a third of the articles I write for this site have some version of that lament, so I am going to forgo it this time around. 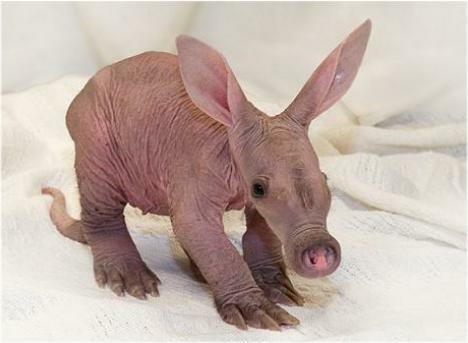 Instead, here is a baby aardvark.